Presented below is CAIDA's latest visualization of both IPv4 and IPv6 Internet topology at the Autonomous System (AS) level. 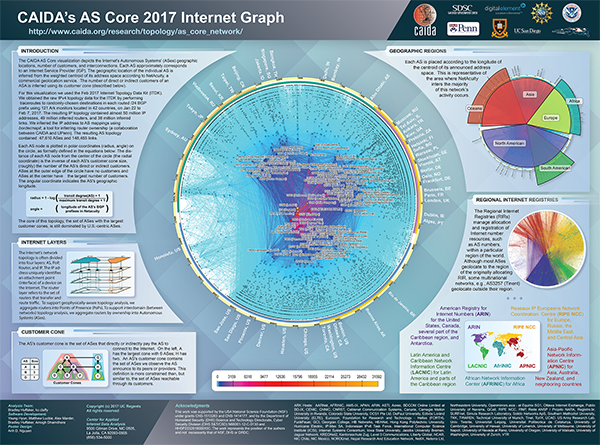 See the IPv4 AS Core in 2017 for details of our latest AS Core 2017 visualization, and download a poster of the latest AS Core visualization. CAIDA's AS Core visualization represents a macroscopic snapshot of IPv4 and IPv6 Internet topology samples captured over the course of a year. The plot illustrates both the extensive geographical scope as well as rich interconnectivity of nodes participating in the global Internet routing system. Coordinated by our active measurement infrastructure, Archipelago (Ark), CAIDA collects data from monitors that probe paths toward millions of networks that cover a large portion of the routable prefixes seen in the Route Views Border Gateway Protocol (BGP) routing tables. Figure 1. Coordinates of AS in AS core visualization. The position of each AS node is plotted in polar coordinates (radius, angle) calculated as indicated in Figure 1, on the right. Starting from 2013 we have made two major refinements to how we create the graph, including how we rank individual ASes, improving our AS Core visualization. First, we now rank ASes based on their transit degree rather then their outdegree. Second, we now infer links across Internet eXchange (IX) point address space, rather than considering the IX itself a node to which various ISPs attach. The examples below illustrate how these changes can affect the resulting data, using samples from our 2013 AS Core visualization. Figure 2: Comparing the global degree, transit degree, and outdegrees of ASes. Using outdegree differentiates leaf nodes 2, 3, 4, and 5 from central nodes 6 and 7, but leaves node 1 with a high degree only because it hosts a monitor. Using transit degree reveals that 1 is actually a leaf node, and differentiates node 6 (which provides transit between 3 ASes) from node 7 (which provides transit only for 2). To place them on the graph, we originally sorted ASes by outdegree, which is the number of outbound links from an AS as observed in AS paths. In Figure 2, ASes 2, 3, 4, and 5 have an outdegree of 0, since nothing follows them in any path. ASes 6 and 7 have an outdegree of 2, while AS 1 has an outdegree of 3 only due to the monitor it hosts. Using transit degree instead drops AS 1's degree to 0, and differentiates 6, which provides transit for three ASes, from 7, which provides transit for only two. Figure 3: Inferring AS connectivity across IX address space. AS 1 and 2's degrees increased as we no longer included their links to the IXes in their degree count, but each gained two direct links. The degree of AS 4 did not change: it no longer had a link to the IX, but we now counted a direct link to AS 1. Only the degree of AS 3 decreased, since it lost the link to the IX and already had a link to AS 2. Our second substantial methodology change was that we infer links across IXes when the IX's address space appears in the traceroute. IXes provide infrastructure fabrics over which other ASes peer. Although the IX may have their own AS and address space, links that cross an IX's address space are actually peering links directly between the ASes connected to the IX, rather than to the IX itself. But raw traceroute data can include IP addresses used by an IX to facilitate this direct peering across the IX. Sometimes an AS might announce the IX's address space, in which case a simplistic mapping of these raw IP addresses to ASes will introduce false peering links between the AS announcing the IX's address space and ASes peering at the IX, as well as hide actual peering links between pairs of ASes on either side of the IX. To recover the true peering connectivity, we infer links across IX address space that is self-identified by the IX in PeeringDB. This new method does not always result in an increase in the degrees of ASes announcing IX address space. In figure 3, AS 3 already has a direct link to AS 2 at some other location, so inferring peering across the IX results in a loss of the link to the IX's AS, and no additional neighbors, resulting in a drop in degree for AS 3. Figure 4: In the IPv4 graph, more then 75% of ASes had a larger transit degree then outdegree, although the relative change decreased as the outdegree increased. For ASes with degree larger then 20, an increasing fraction had transit degrees smaller than their outdegrees. Figure 5: Our second methodology change -- inferring IPv4 links across the IX address space -- yielded modest change (usually an increase) in transit degree for most degree ranges. ASes with moderate degrees using the old method saw the largest percentage change with the new method. The four ASes who dropped their degree over 90\% were either IXes or announcing IX address space. 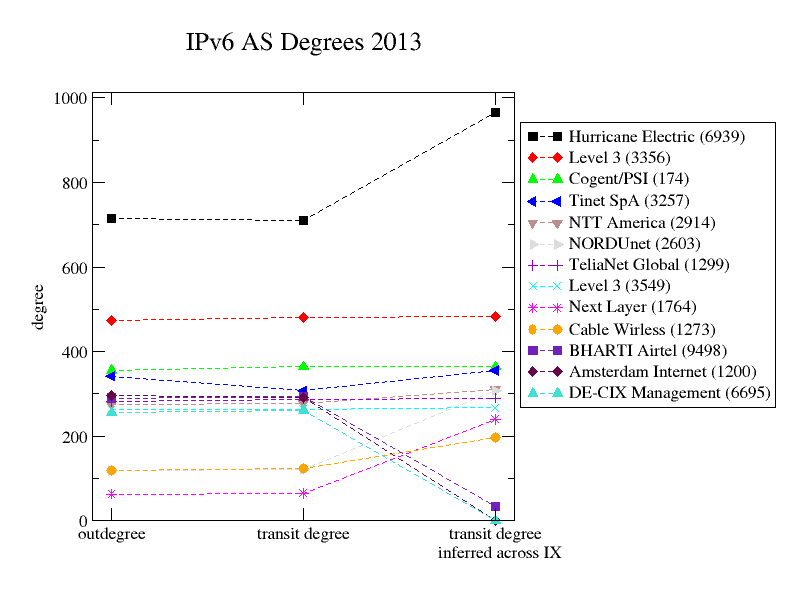 Figure 6: Focusing on the top ten ASes, ranked by outdegree, transit degree, or transit degree given inferred links in the IPv4 graph, Hurricane Electric (AS 6639) was the only AS whose outdegree was significantly larger then its transit degree, unsurprising given the two Ark monitors inside Hurricane Electric. Hurricane Electric (AS 6639) also saw the most new links inferred across the IX address space, which increased its degree by 32.3% from 2053 to 2714. 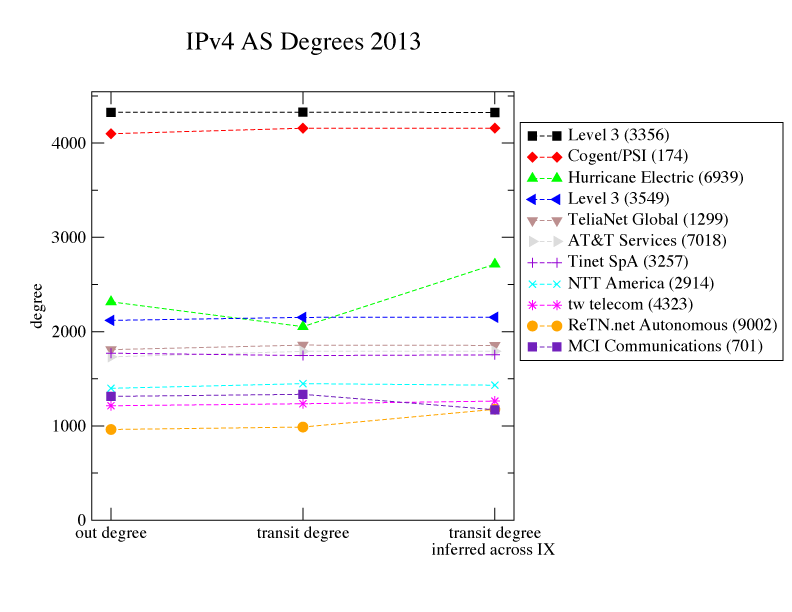 Figure 4 shows the change in AS degrees when switching from the use of outdegree to transit degree for IPv4 ASes. More then 75% of ASes had a larger transit degree then outdegree, although the relative change decreased as the outdegree increased. For ASes with outdegree larger then 20, an increasing fraction (but never above 25% of ASes in a bin) had transit degrees smaller than their outdegrees. Figure 5 shows the percentage difference in transit degree when removing links connected to ASes announcing IPv4 IX address space, and adding AS links inferred across IX address space. The effect on transit degrees is subtle; ASes will both potentially lose links to IX address space and potentially gain new links across the IX. In our data, bridging inferences across the IX address space resulted in a loss of 5% of the existing IPv4 links, but yielded an additional 7,000 links (12% of the original), for a net 7% increase in links. Half of the ASes saw less than 10% change in their transit degree. ASes with moderate (between 100 and 360) transit degrees using the old method saw the greatest relative change to their transit degree. Among the top 50 ASes by the old method, 4 had their transit degree drop to less then 10% their old value (these 4 were IXes or announcing IX address space). Figure 6 focuses on the top ten ASes, ranked by outdegree, transit degree, or transit degree given inferred links in the IPv4 graph. Hurricane Electric (AS 6639) was the only AS whose outdegree was significantly larger then its transit degree, probably due to the two Ark monitors they host. Hurricane Electric (AS 6639) also saw the most new links inferred across the IX address space, which increased its degree from 2,053 to 2,715 (32%). ReTN.net (AS 9002) saw its transit degree increase from 988 to 1,176 (19%). Most of these ASes had transit degrees within 1% of their outdegrees. Figure 7: In the IPv6 graph, 75% of ASes had transit degree larger than their outdegree. Unlike in IPv4, 5% of ASes with outdegrees larger than 5 had their transit degree drop almost to 0, typically in cases where they were hosting an Ark monitor (which increased their observed outdegree but would not affect transit degree). Figure 8: In the IPv6 graph, 75% of ASes had their transit degrees increase when links were inferred across IX address space. For the top 50 ASes by the old method, 4 of them (which were either IXes or announcing IX address space) saw their degrees drop to almost zero. Figure 9: This plot shows the effects of our two methodology changes on the degree of the top ten ASes in the IPv6 graph ranked by by outdegree, transit degree with IXes as nodes, or transit degree with links inferred across IXes. Outdegree and transit degree are almost the same for all ten ASes, but inferring links across IX address space caused 3 ASes to drop out of the top ten and 3 new ASes join. Hurricane Electric transit degree increasing by 36%, increasing the gap between itself and the next largest AS. Figure 7 shows box plots of the percentage differences between degree and transit degree for ASes in the IPv6 graph. IPv6 sees an effect similar to the IPv4 graph: more then 75% of ASes had a larger transit degree then outdegree, although the relative change decreased as the outdegree increased. Unlike in IPv4, 5% of ASes with outdegrees larger than 5 had their transit degree drop almost to 0, typically in cases where they were hosting an Ark monitor (which increased their observed outdegree but would not affect transit degree). These ASes had a similar drop in the IPv4 graph, but the smaller size of the IPv6 graph increases their visibility. Figure 8 shows that 75% of ASes had their transit degree increase when links were inferred across IX address space. For the top 50 ASes by the old method, 4 of them (3 IXes and an AS announcing IX address space) saw their degrees drop to almost zero. Half of all ASes had their degree change less than 25%. Of the top ten ASes by transit degree in the graph where we treated IXes as nodes, Hurricane Electric's transit degree increased by 36% when we inferred links across the IX address space. As expected, the Amsterdam Internet Exchange (AS 1200) and the German Internet Exchange (AS 6695) saw the largest drop in transit degree when we removed links directly to IXes. Although Bharti Airtel (AS 9498) is not an IX, it was announcing an an IX's address space and so its transit degree dropped 88.4%. NORDUnet (AS 2603) and Next Layer Telecommunication (AS 1764) both joined the top 10, with transit degree increases of 155.8% and 269.2%, respectively. The larger role of IXes in the less mature IPv6 topology is reflected in the stronger effect their removal has on the degree-based AS ranking. Figure 10: In the IPv4 graph, the combined effect of switching from outdegree to transit degree as inferred across IX address space resulted in all low-degree (less than 10) ASes increasing their degree, and most (75% of) remaining ASes increasing or keeping the same degree. Some larger degree ASes dropped degree dramatically, typically because they were IXes or announced IX address space. Figure 11: In the IPv6 graph, the combined effect of switching from outdegree to transit degree as inferred across IX address space decreased the degree for half of the top ASes ranked by outdegree. In both IPv4 and IPv6, the most connected ASes experienced limited effects due to the change from outdegree to transit degree. In most bins, more than 75% of ASes increased their degree. IPv6's top bin (top 25 ASes by outdegree) was the exception, with over half decreasing their degree, due to the many IX ASes represented in this bin. In both IPv4 and IPv6, Hurricane Electric (AS 6939) saw its transit degree increase by over 30% when links were inferred across IX address space. Most other highly connected ASes in IP4 saw little change due to the IX node removal, but the IPv6 AS graph's top 10 saw significant change due to the larger role of IXes in the less mature IPv6 topology. This AS core visualization addresses one of CAIDA's topology mapping project goals: to develop techniques to illustrate structural relationships and depict critical components of the Internet infrastructure. We have prepared a historical view of AS Core visualizations including the latest AS Core currently available.